Italy shines bright at their home tournament, Bologna Invite! Seven senior national teams and four U24 national teams came to Bologna for an early season tournament in Bologna last weekend. The tournament was full of very close games and some very exciting results. Here are the main stories to take away from the event. The final of the tournament was between Italy and Italy U24. This shows the incredible depth that Italy has as a nation. Italy defeated their little sisters in the final 11-7, capping off an undefeated weekend for the Italians. They did have a close game against Poland, which they won 9-7, but aside from that they handled competition with relative ease. They were clearly the best team at this tournament and with a huge contingent of players from the Bologna area, they are likely to get stronger and even more cohesive over the months leading up to the EUC in July. Sofia Scazzieri was particularly impressive on this team making some very key defensive plays throughout the weekend. The team was a real unit through and through as they look to continue off of the success they had with their top club team, CUSB Shout, who won the EUCF last year. Italy U24 was a bit more of a surprise. They did not send a women’s team to Perth for WU24 last year and at the last WJUC their U20 team ended 10th. However, this new Italian U24 team showed a lot of team cohesion and a lot of fight at their home tournament. Wins over teams like France, Switzerland and the Czech Republic senior teams showed that this team is in very good shape early in the season. Just like their older counterparts they look to be off to a great start this season and should be a team to watch at the WU24 championships in Germany this July. Great Britain is in a bit of a building year. Their roster is missing many of the typical names associated with elite women’s ultimate in the UK. However, the team had a lot of success in Bologna. They beat every team except for Italy on the weekend. Newcomers to the team made big contributions including European Youth Player of the Year candidate Rupal Ghelani. Leila Denniston also proved difficult for teams to deal with as she came up with clutch defensive play after clutch defensive play. However, they did struggle against France in the bronze medal match. France was able to take GB to double game point and was even able to force them to turnover the disc. One unforced throwing error by France gave GB good field position to take the win. France did have a very well drilled offensive system which separated them from many of the other teams in the division at Bologna. However, aside from some of their top talent like Aline Mondiot and Anne Le Borgne, France lacked top end play makers. A fourth place finish was a great performance for the French and will need to keep building on chemistry and consistency if they want to challenge top teams in July. Switzerland did not meet expectations this weekend. Star player Olivia Hauser did not play and they were missing some other players as well, but even with those absences not many would expect a defending EUC silver medalist to come 9th at this tournament. The Swiss were, in a way, the opposite of France. They boasted a lot of talent but their offense could not find the click it needed to stay consistent enough to beat teams like France and the Czech Republic. Despite great offense by Isabelle Güttinger and strong defensive plays by Laura Niederhauser, they could not manage to win important games throughout the weekend. It is still early in the season so this team does have some time to coalesce their talent into something much better in July. Aside from Italy dominating the competition, the scores were very close throughout the weekend. France, who placed 4th, only beat Switzerland (9th) by a single point showing how close the division was. Even Austria, whose Saturday record was disappointing, managed to get a win against the 2nd place finishers, Italy U24. Of course 50 minute games do not have much time for teams to gather a big lead, and this is a very early season tournament. Those caveats aside, this does predict that the EUC will be very competitive among the second tier of teams. One story line from the weekend is about who was not there. Unlike the men’s division, where most medal contenders were in attendance, there were at least three large absences in the women’s division. Finland, Germany and Russia all opted to not make the trip to Bologna. While Italy did look dominant here, it is still unclear how they slot in among those three strong nations. We will get our first look at Finland and Germany at Windmill later this year, but we will not get to see the Russian national team in any of the major tournaments until the EUC in Hungary. 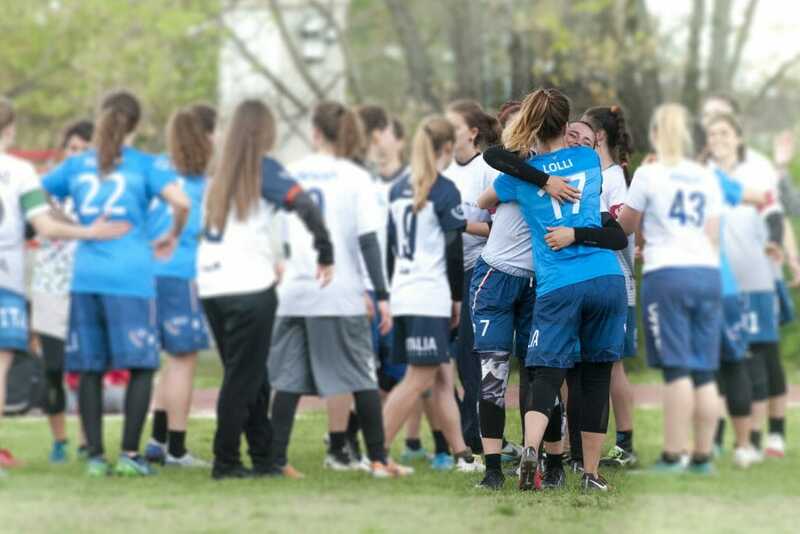 Comments on "Bologna Invite 2019: Tournament Recap (Women’s)"